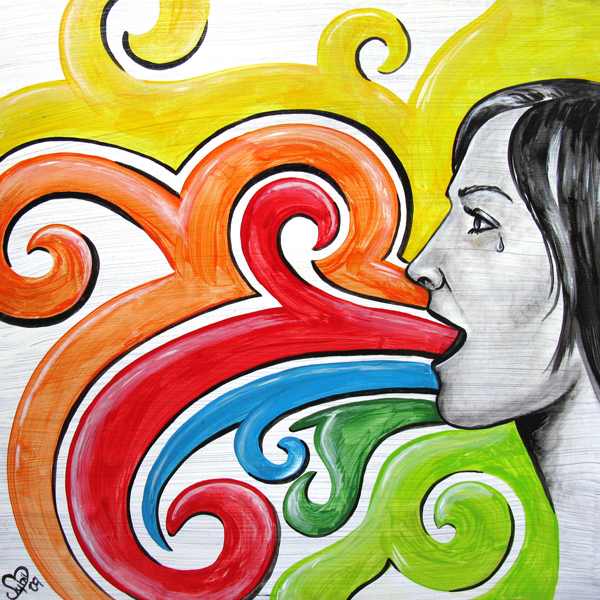 The painting “Colorful Words” was painted in a time of frustration for me. I can’t remember what or who exactly I was frustrated with, but I do remember wanting to paint about it. It’s about sometimes wanting to use colorful words that may not be the nicest words and then rethinking it. Sometimes, we let those words slip out and sometimes we come up with a better, more loving way to say what we want to say. Sometimes, we just don’t say anything at all. Ultimately, we should try to use colorful, descriptive words that actually convey what we are feeling and are also hopefully constructive rather than destructive. With that said, one of the main reasons I love art and creating is that it lets me “say” what I can’t always say with words.